Wednesday, October 23 1907 -- William Collier's play "On The Quiet", originally staged on Broadway in 1901, has made its way to LA where it plays to rave reviews ("two dollars worth of laughs for six bits"). 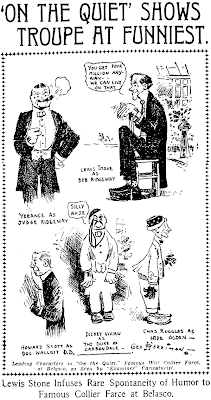 Herriman sketches the leads, including a very young Charlie Ruggles. Ruggles went on to make over 100 movie and TV appearances, and it all started right here in li'l ole LA. I urge you to give that Sam figure an unhurried appraisal. A lesser cartoonist could have drawn that a hundred times in a hundred ways and not come up with something that so effectively gets the message across. Amazing work. "Lewis Stone infuses rare spontaneity of humor"
That's very diffrent from when he played Judge Hardy in the Andy Hardy series. Obscurity of the Day: Can You Solve the Mystery? In 1983-84 the Meadowbrook Creations book publishing company hit upon a successful series with Can You Solve the Mystery, aka Hawkeye Collins and Amy Adams. The young adult books contained short stories in which a pair of pre-teen sleuths solved crimes. Hawkeye was a quick-sketch artist whose drawings, reproduced in the books, contained all the necessary clues for the reader to solve the crimes. The books were all credited to one M. Masters who was more than likely actually Bruce Lansky, the head of the publishing company. For reasons unknown the book series sputtered out after a dozen or so installments, but meanwhile the concept was transferred to a newspaper strip distributed by News America Syndicate. The concept seemed like a winner -- each mystery played out in just a single week of dailies, and a separate mystery was presented in the Sunday pages. Editors certainly couldn't resort to their usual refrain about stories being too long on this strip! The pressure to produce two new mysteries a week seems to have been a little ambitious for the creators, though. Whereas in the books there was at least a little room for a storyline to develop and clues to be strategically placed, the newspaper strip was a real 'wham-bam-thank you ma'am' sort of affair. In the sample above, for instance, I really don't see how anyone could be expected to solve the mystery themselves (or maybe I'm just not good gumshoe material). The series began on August 5 1984 with two veterans at the helm -- Jim Lawrence supplied the stories and Fran Matera the art. First to bail on the project was Lawrence, whose last daily was October 20 and last Sunday November 11. This was his last newspaper strip credit, after which apparently he went to work for the computer game company Infocom writing scenarios for text adventure games. After Lawrence left Matera took solo credit for a short while -- whether he supplied the stories or the writer just didn't take credit I don't know. Soon, though, a new writer came to the rescue, none other than the possibly hypothetical M. Masters, author of the books. He/she/they got credit on the dailies starting November 26 and the Sundays on December 16. In May 1985 another shake-up occurred. Fran Matera disappeared and was replaced by Duane Barnhart. At the same time the M. Masters credit disappeared from the dailies. Until the end of the series on December 29 1985 Barnhart apparently produced the daily alone while Masters supplied the scripts for the Sunday only. Adding to the confusion are a smattering of Sundays (and probably dailies, too) which are uncredited and feature some seriously amateur art. Among those dates are May 26, June 23, October 6 and October 13. You don't need Hawkeye Collins sketching clues to know that this creative musical chairs act spelled doom for the series. Can You Solve the Mystery ended on December 29 1985 with only a handful of clients gamely sticking with it until the end. There was a similar series based on another set of children's books just before that, with art by Frank Bolle. Yes, I remember it too! It was Donald J. Sobol's ENCYCLOPEDIA BROWN, syndicated by Universal Press in the Seventies. It was written by Elliot Caplin (with art by Bolle). Encyclopedia Brown is on tap next week -- stay tooned! Yeah, I'm reading this on newspapers.com and there was an article mentioning it got extremely low ratings, which adds to the cancellation. "It's my idea of clean, simple humor," says Cartoonist Jeff Keate of "Rufus," the Sunday romps of a disheveled dog offered by Chicago Tribune-New York News Sept. 17. "I really think there's a crying need for humor. My page won't carry any message." Mr. Keate's particular brand of humor once led to a magazine cartoon showing four octopuses meeting under ocean, shaking hands and getting all balled up in tentacles. His apt kidding of the social situation brought a lot of letters. Born in British Columbia, the cartoonist got encouragement from his father, who was in the lumber business but apparently had a suppressed desire to be a cartoonist. "It reached the point when I was a kid that whenever I drew on walls, instead of erasing the stuff, he'd buy frames to put around it." He came to the U. S., of which he's now a citizen, to go to college at Grand Rapids and to the Chicago Academy of Fine Arts. But when he graduated in 1936, he tried to get on newspapers without any luck. While those were the lean years, (he was once down to 25 cents), he generally managed to make $20 to $25 a week cartooning. "And in those days it didn't take much to live," he recalls. "I had enough for the rent and night clubs too." His first sale was to King Features — a gag panel. He was shortly hitting the slick magazines too, but not in full force until he came to New York in 1945. He's now averaging about 20 magazine sales a month. For the last few years he has been doing "Time Out," a daily sports panel for the Publishers Syndicate, which, he says, is profiting from the TV-boomed interest in that subject. In 1947, he and six other free lance cartoonists began a CT-NYN Syndicate panel, "Today's Laugh." Each participating artist produces one laugh a week. While gags about vaudeville dogs were popular for a time, Mr. Keate feels the trend right now is toward playing them "straight" which is what he mainly does in the new page. The "Rufus" of the strip, whose antecedents are doubtful, is actually based on Mr. Keate's English setter named "Rufus." As two comic strips already have English Setters, that breed had to be avoided. Another character in the comic is a man "An average, middle-aged, bald-headed type you don't particularly like or dislike." Like many a successful cartoonist, Mr. Keate is sometimes puzzled at the way readers see things in a cartoon that weren't intended. He once drew a cartoon of a bush growing right next to a tall tree. A tree doctor was bending over the baby vegetation saying, "Kitchy-kitchy-koo." Later, the cartoonist met a young thing who gushed: "Oh Mr. Keate, that was certainly funny, your cartoon showing a doctor getting hay fever!" Hi, this is Ron (Tampa FL). I own a nearly complete run of the 'Brown Boys' strip from around 1935-1936. I have 115 pages original art plus a few proofs. Appears to be unplublished from American Features syndicate. Does anyone have additional details on the strip or its creator John Jay Humski. I bought this from an auction site in 2009, and hasnt been much inifo on this forgotten strip. Jeffrey Lindenblatt, publishing impresario, microfilm maven and good friend of Stripper's Guide, has a few questions on his mind. Can you assist? * Jeff is looking for early Archie dailies for an upcoming publishing project. The early years of the strip, especially the daily, are extremely hard to find and he is looking to fill gaps in 1946. If you can help, reply here or email me for Jeff's contact info. Jeffrey is not only looking for tearsheets but even any leads to newspapers that ran the strip in that first year. According to a 1946 E&P ad it was picked up in a lot of major cities in 1946, but it seems like many of them paid for it but didn't run it (not all that unusual in the days of exclusive territories). * Jeffrey is also a little perplexed about the comic strip Dan Dunn. While doing some research on NewspaperArchive.com, he found that, as is well-known, the strip was dropped in favor of Alfred Andriola's new strip, Kerry Drake, by Publishers Syndicate, in October 1943. However, detective Dan didn't rest. Instead his adventures were reprinted in quite a few newspapers as late as 1950. Jeff and I agree that this isn't really typical of Publishers Syndicate to sell a strip in reprints -- so why did Dan Dunn have this long reprint run? Anyone have any ideas? * Last but not least, Jeffrey wonders if anyone has seen copies of an odd weekly newspaper called Favorite Features that was published in New York City starting July 12 1967. It ran pretty much just syndicated columns and comics. It seems to have been short-lived. A googlenews search shows a Pittsburgh Post-Gazette promo saying that Archie will start in that paper beginning February 4, 1946. Viewing that paper dated later in 1946 shows it actually was running there in that year. 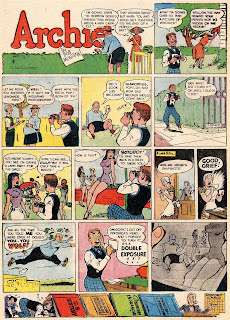 Hello, Allan----"Archie" was running in the Saturday CHICAGO AMERICAN comic section in 1946. Also try the Manchester (N.H.)LEADER, Bob Montana's hometown paper.----Cole Johnson. Hello. Allan----Bob Montana was one of the all-time greats. He had a wonderful talent for timing, expressions, and positioning. Best of all was his consistant and truly funny writing on the strip. Many successful, long-running comics waddle on for years without ever being really funny. I can't imagine anyone ever actually laughing at a WINTHROP, SMITTY, NANCY, SHORT RIBS, and about a million more. ARCHIE, however, gave me many real laughs under Montana's stewardship. he aggressively tried to be funny. He depicted jealousy, vengeance, stupidity, and slapstick----all thrown away after Montana's death in 1975. Today it's just an unsigned hack job, a humor-free parade of copyrighted trade marks, strictly politically correct. To effect this holy goal, those Riverdale rascals just don't do anything anymore. (If your characters just stand around and make puns, you can be safe not to offend anyone. ) It's as bland as most modern strips.----Cole Johnson. Allan, You observe that it wasn't typical for Publishers Syndicate to sell a strip in reprints, as it did with DAN DUNN, but was such a practice typical with other syndicates back in the day? Any idea of how many strips, like PEANUTS today, have lived on for years as reprints? Surprisingly, not many strips were sold in reprints 'back in the day', and when they were they were rarely classics like Peanuts. Syndicates sold their backstock of lackluster strips mostly to hole-in-the-wall type outfits who then resold the material cheap to small rural papers. 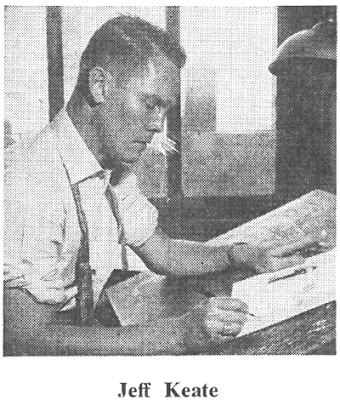 International Cartoon Company, for instance, bought from several syndicates -- George Matthew Adams, Associated Newspapers and even occasionally a minor feature from the big boys like Hearst and Pulitzer (which leads me to think that maybe the cartoonists took their drawings with them after their series was cancelled and sold it to International themselves). Only Bell Syndicate seemed to make it an established practice to sell reprint rights; they had a deal with Western Newspaper Union that lasted for many years. Thanks for the info, Allan. My local weekly paper (one of those community giveaway papers; I live in suburban Cleveland, Oh.) occasionally will toss in a few comic strips in the back pages, and sometimes they'll use POPEYE, which always amazed me because they were just using a single daily strip on a random basis. But then I learned the POPEYE daily itself has been in reruns for nearly 20 years, so it must be available pretty cheap these days. Was FAVORITE FEATURES just something put out during a newspaper strike to keep the strips and columns in print in N.Y.? Something to do with copyrights or something?---Cole Johnson. That may well be the case. That WAS a bad time to be a newspaper reader in NYC with all those strikes! Paul West had what I can only describe as a really repellent cartooning style, but for some reason the New York World thought a lot of him. Although West didn't draw that many comic strip series in his career, his cartoons often 'graced' the masthead of the World's comic section in the late 90s and early 00s. 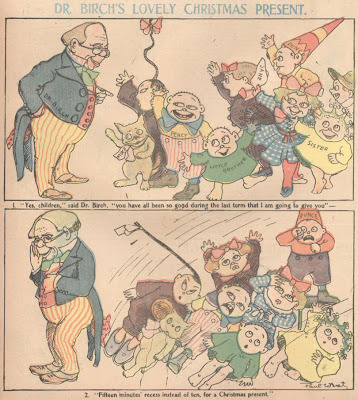 The Doctor Birch's School series ran from September 9 to December 23 1900. Paul West drops off my radar in 1903, then shows back up in the teens at the New York Herald, where he penned the poetry for a number of the Sunday magazine cover series. Paul West later joined forces with legendary illustrator W.W. Denslow (he illustrated "The Wonderful Wizard of Oz" in 1900 among other books and also created the comic "Billy Bounce")and wrote the book fversion of Billy Bounce which Denslow illustrated. The book is available for download on lulu.com website. Oh, and I agree with you--West's drawing style is repellant. Hi Allan -- Long time no see, etc. About Paul West: before passing to the NY Herald, he signed the script of "Billy Possum" for the Chicago Tribune in 1909. He died (by accident? By suicide) in Paris around September 22 1918; on September 29, after a week from his mystery disappearance, his body was found in the Seine River, "fully Dressed in His Red Cross Uniform". He was a Captain and the Director of the Editorial and Historical Bureau of the American Red Cross in Paris. He had been severely gassed in Soissons, and was about to return to the US to recover. He was possibly one of the first comics writers who signed his work. Thanks for the interesting info about Paul West. Billy Possum, which I see in your book, is something I seem to have missed when I indexed the ChiTrib. The sample you show is pretty text-heavy, but no more so than some of his Herald work which I did index. 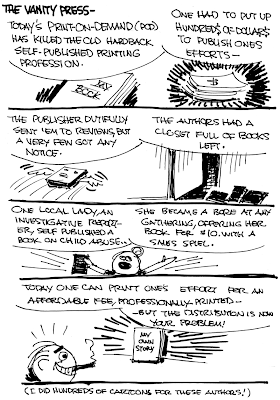 Maybe the microfilm I worked with was missing those pages (like it was missing all of Wee Willie Winkie). What (English) months do MAG and LUG stand for? MAG = MAGgio = May; LUG = LUGlio = July. The other month abbreviations used in "Here We Are Again" are GEN= GENnaio = January; FEB = FEBbraio = February; MAR = MARzo = March; GIU = Giugno = June; AGO = AGOsto = August; SET = SETtembre = Septmber; OTT = OTTobre = October; NOV = NOVembre = November = DIC = DICembre = December. As Steve Martin once said, "It's like those foreigners have a different word for EVERYTHING!". 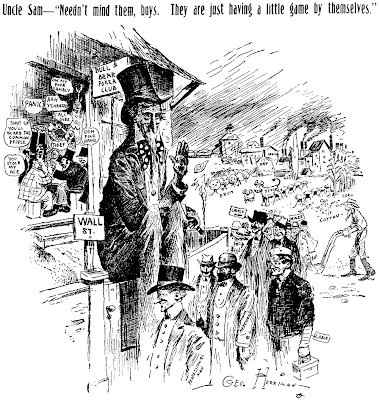 West would do unusually topical subjects and caricitures of figures in the news with the Roly-Polys in the masthead cartoons of the Funny Side in those days. 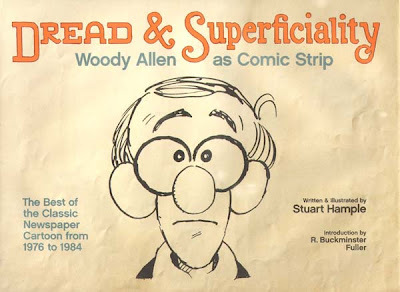 "Inside Woody Allen" was a comic strip that ran from 1976-84. It never appeared in many papers, which was as it should be since, frankly, it wasn't that great a strip. The feature starred the famed comedian/filmmaker who was at the time riding high on a string of smash hit movies. Although Woody's persona was all there -- the neuroses, the philosophy, the skirt-chasing -- in the comic strip he was scrubbed so clean, so innocuous, that it may as well have been a strip about Bob Saget. What makes the book a worthwhile read certainly isn't the strips, which are reproduced in great abundance, and it certainly isn't for the intro by R. Buckminster Fuller, whose bizarre attempt at a comic strip got the best of me after a few pages. The highlight of the book is a 16-page introduction by cartoonist Stu Hample which traces the development of the strip and its travails with the syndicate. This is a great insider narrative that provides insight on the way syndicates, newspapers and comic strip creators interact. I felt this alone was worth the price of the book. One interesting design choice in the book should be mentioned. The nearly 200 pages of strips are all reproduced from original art, with corrections, blue lines and margin notes intact. The strips are all photographed in color, despite all the originals being in black and white. I can see reproducing a selection this way, but it seems an odd choice for an entire book. The production costs for all that color (even though the only actual color is just cream colored paper and blue pencil) explains the $35 price tag.